Apple’s R&D/sales ratio is between Dell and HP, companies which do not develop their own software or hardware. Beside the absolute, relative to sales and relative to peers, another perspective is to measure relative growth. 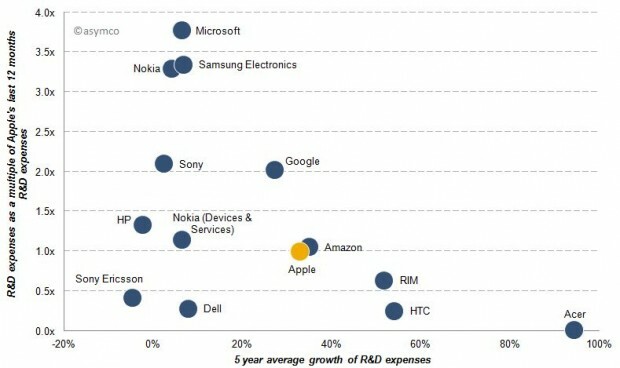 The following chart represents shows the 5 year average growth of R&D expenses and on the y-axis the size of last 12 months R&D expenses as a multiple of Apple’s R&D costs . 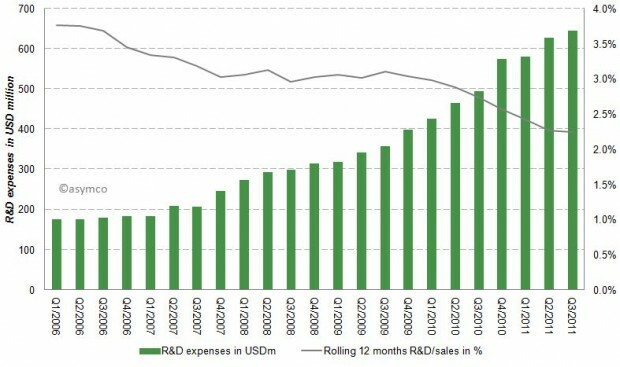 Acer’s R&D expenses for example are almost non-existent compared to Apple, but have grown almost 100% per year while Microsoft’s last 12 months R&D expenses are almost 4x that of Apple’s and have only grown slightly over the past five years. Google’s R&D costs have grown at a similar rate compared to Apple, but remained double those of Apple’s throughout the last five years. 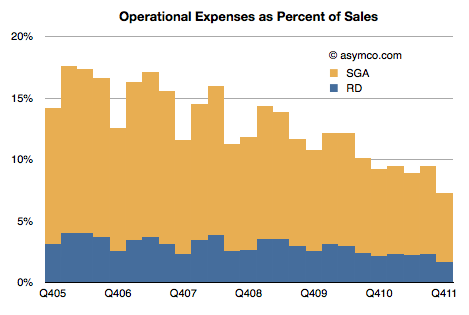 Finally, we should look at the payoff from R&D spending over the last five years. R&D growth should result in margin improvement, but does it? The following chart shows the relationship between spending (size of bubble), margin improvement (x-axis) and sales growth (y-axis). Of our sample, only three companies have achieved sales growth AND simultaneous margin improvement over the last five years. But while Microsoft and Dell have achieved sales growth and margin improvement slightly above zero, Apple has improved its bottom line by 13 percentage points and its top line by an average rate of 45%. 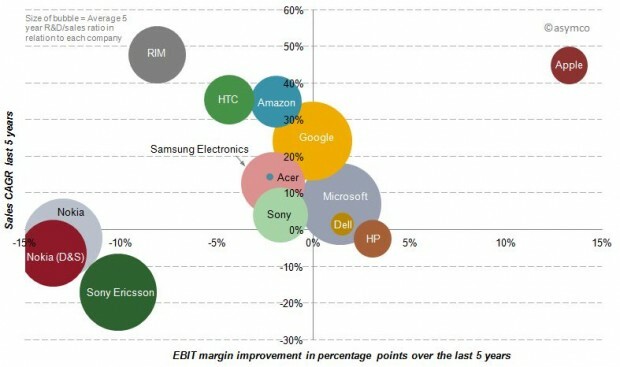 In spite of Microsoft’s, Google and Nokia’s massive R&D growth, their returns from that investment have been meagre to negative in terms of margin and only Google showed appreciable sales growth. R&D expenditures on a stand-alone basis, in absolute or relative terms, do not correlate with disruptive growth. Essentially, you cannot buy innovation. In fact, sometimes it’s nearly free. Most startups spend less on R&D than large companies do on stationery and yet the bulk of wealth creation has come from these tiny companies. The challenge is, in fact, that if you have resources you find ways of spending them (the quaint American cliche of ‘cash burning a hole in your pocket’). The temptation is always there to fund a new initiative which bright people can always envision. Leadership in innovation is not the courage to spend but the courage to focus. Our set of peer companies as shown in previous posts but excluding LG, Lenovo and Motorola Mobility due to lack of data, but including Sony Ericsson and Nokia’s mobile phone division Devices & Services. In this post “year” and “last 12 months” refers to the time frame from Q4/(year-1) year to Q3/year due to lack of published data regarding Q4/2011. Five year data runs from Q3/2006-Q3/2011. 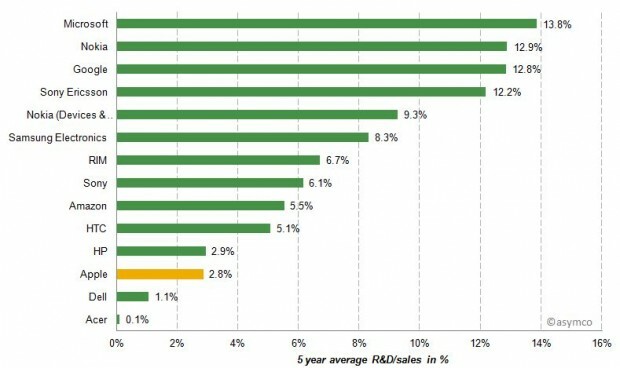 A note on capitalized R&D: Most of the companies analyzed do not have capitalized R&D costs. Some have small capitalization, but so small that the inclusion would not change the decimal points of percentages. The only significant amount of capitalized R&D appeared in Amazon’s earnings releases: capitalized R&D cost were USD 100 million in Q3/2011. The amortization of theses costs in included in Amazon’s EBIT (Operating imcome).